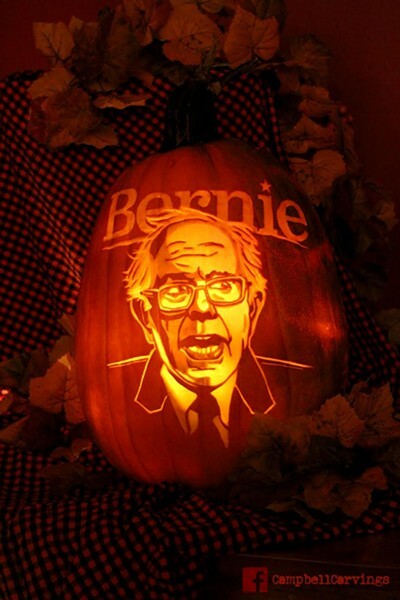 All hail the BERN-KIN! 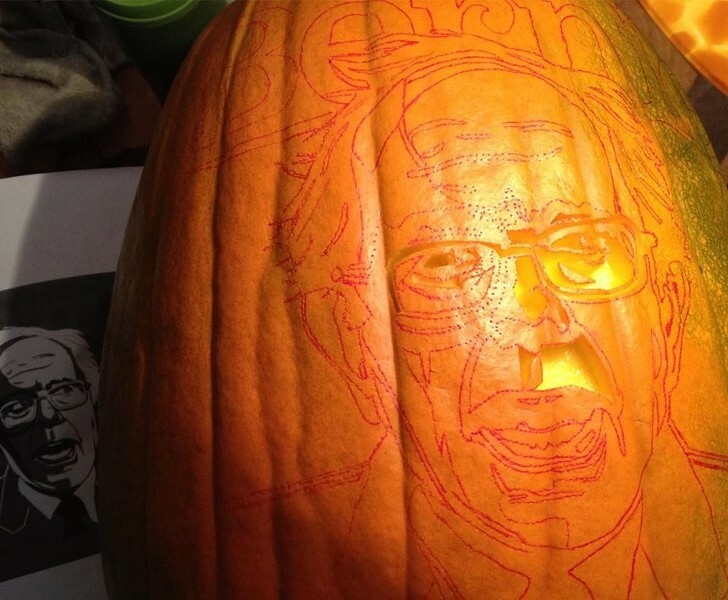 'Tis the season for crunchy leaves, pumpkin spice lattes and combining political iconography (read: Bernie's face) with beloved Halloween traditions. As far as carving jack-o'-lanterns goes, some people can only manage the classic "triangle eyes" design, or prefer not to wield knives at all. But Ashley Campbell of Campbell Carvings is not one of them. This year, the co-owner of Shelburne's Rustic Roots restaurant has put her prodigious carving skills to work creating an ephemeral masterpiece of socialist portraiture. This past Monday morning, armed with woodcarving chisel and pottery loop and a design adapted from artist Brian Crim, Campbell went to work on a pumpkin selected from the Isham Family Farm in Williston. It took her 10 hours, from 10:30 in the morning to 9:30 at night, with an hour's break. Visitors can pay homage to Campbell's handiwork, and presidential candidate Sen. Bernie Sanders, in the Rustic Roots entryway — but not for long. When asked about the Bernkin's lifespan, Campbell says, "I'm hoping for a week — ’til Halloween." Campbell has been cutting up pumpkins since she was a kid, but says she's been "carving more seriously since 2008," when she started accepting commissions. In 2012, she and her father, Steve, were guests on "The Dr. Oz Show," where they presented a portrait of the television personality. As for the Bernkin, Campbell says, "I'm just hoping this goes a little more viral — and that Bernie actually sees it." Seven Days coeditor Pamela Polston got the full scoop on Campbell in 2013, when the latter moved from New Jersey to join her husband in Shelburne. If her most recent masterpiece is any indication, she's certainly embraced her new home. "People in Vermont have a lot of pride in Bernie right now," Campbell says.